Oliver Otis Howard was a one-armed Union Army general who became one of Reconstruction's most important and controversial figures. Chosen to lead the Freemen's Bureau after the Civil War, he was charged with turning four million newly freed slaves into full citizens. But as Reconstruction failed in the mid-1870s, General Howard turned away from the progressive vision of government he had pioneered. Rejoining the army and moving to the Pacific Northwest, Howard assumed the task of protecting white settlers who claimed ownership of the new frontier. In the summer of 1877, he commanded the U.S. Army to attack, pursue, and ultimately capture Chief Joseph and about 750 Nez Perce men, women, and children after they refused to abandon their ancestral homeland for a reservation. Chief Joseph is one of history's most celebrated Native American leaders. After the war, he became an international icon of civil rights and nonviolent activism. Ironically, Joseph's vision of America was remarkably close to the mission that General Howard had embraced during Reconstruction. 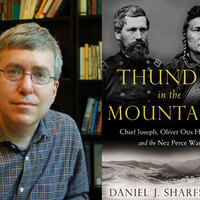 Recreating the Nez Perce War through the voices of its survivors, Daniel J. Sharfstein's visionary history of the West casts Howard's turn away from civil rights alongside the nation's rejection of racial equality and embrace of empire. The conflict becomes a pivotal struggle over who gets to claim the American dream: a battle of ideas about the meaning of freedom and equality, the mechanics of American power, and the limits of what the government can and should do for its people. Daniel J. Sharfstein is a professor of law and history at Vanderbilt University and a 2013 Guggenheim Fellow. His first book, The Invisible Line: A Secret History of Race in America, received the J. Anthony Lukas Prize.